Keto Meatballs! 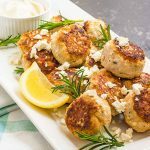 Low Carb Chicken Feta Meatballs to be exact. If you want a versatile recipe that can be added to various sides or even served as an appetiser this ketogenic diet recipe is for you. In a bowl place all the ingredients, except the butter and oil, and combine well. For best results we recommend putting on a set of disposable gloves and mixing by hand. Roll the mixture into evenly sized meatballs. We made ours quite large and ended up with 28 meatballs. Place the meatballs into the frying pan and cook for 7 minutes on each side. You may need to drop the heat if the meatballs are browning too quickly.